Tilly And The Buttons’ Etta is a flattering fitted dress that falls just below the knee, my favorite length. The dress is shaped with darts at the bust, waist and shoulders. It has lined cap sleeves, an invisible zip at the back and a lovely V-back collar. As usual with Tilly patterns, the instructions were clear, the size was right, and I enjoyed every minute of the making. For the fabric, I used a stretch black cotton. The cotton has a bit of sheen, perfect for upping the elegance. Now, about that time-consuming part. 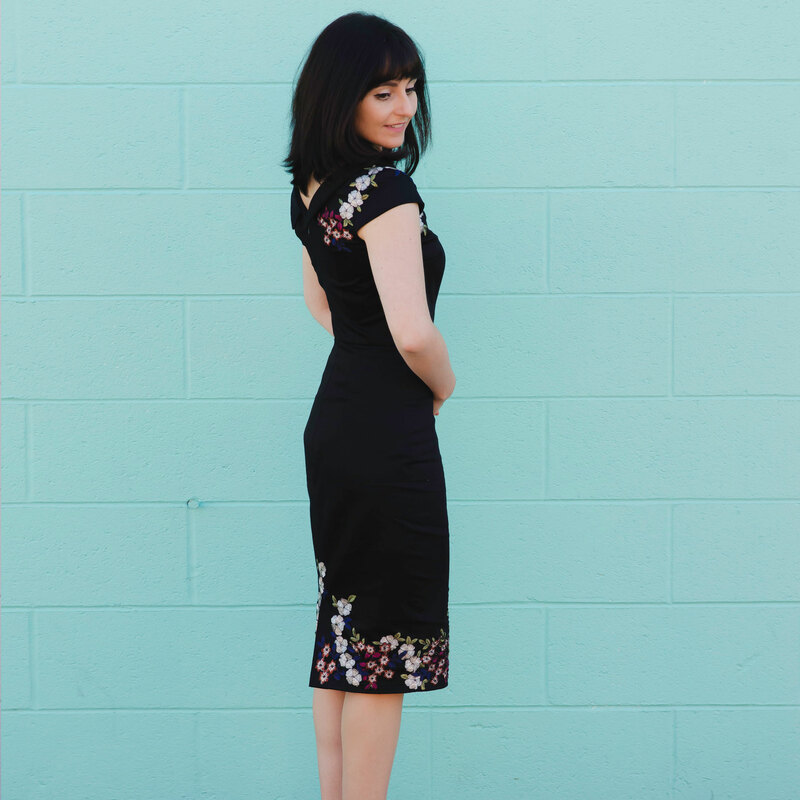 To personalize this little black dress, I cut into some embroidered mesh and composed the floral embellishments around the shoulders and the bottom of the skirt. This was my first time doing this sort of thing, and I most definitely underestimated the tedium of cutting all the tiny flowers, arranging them on the garment, and then hand-stitching each one of them! I can only hope my wrist recovers from it all! But what’s most important is the result, and I love it. The appliqué symmetry on the back of the shoulders accentuates the V-back neckline, while the asymmetry on the front of the shoulders nicely frames the bust area. All told, this Etta is the perfect dress to wear on special occasions. I will do so next week in fact when I fly back to Vancouver for my Canadian Citizenship Ceremony. This is a big deal for me and a milestone in my wonderful Canadian journey that started 9 years ago. I’ll be wearing this dress. Perhaps I’ll even listen to some Etta James on the flight in to ensure I have one of her songs stuck in my head! Soooo beautiful! Wow. Awesome job. Have a wonderful time with your ceremony! Thank you so much Juliana! ☺️💕Sewing this dress was a lot of fun! Really beautiful. So worth the effort and a lovely frock for your big event! That is just beautiful and really suits you. I’ve just bought some fabulous embroidered ankle boots from M & S and I have been thinking about making a black dress with appliqué to go with them. I love citizenship ceremonies and I love this dress! Kudos! Thank you Victoria!!! 😊Those ceremonies are so emotional! Oh My Gosh! That is a stunning dress and embroidery!! You look divine… I hope you have a grand time in your new dress. I believe your time and effort was well worth it. Congratulations.